You can help your pet's health with pet aromatherapy using essential oils. Aromatherapy and essential oils have been used for thousands of years for healing and anointing. Records dating back to 4500 BC describe the use of balsamic substances with aromatic properties for personal, medicinal and spiritual use. The rediscovery of essential oils into modern medicine began during the late 19th and early 20th centuries. Rene-Maurice Gattefosse PhD, a French cosmetic chemist known as the father of aromatherapy, began studying oils in 1907. Gattefosse discovered lavender oil’s ability to assist in the healing of burns after immersing his own burned hand into a vat of lavender oil following a laboratory explosion in 1910. Essential oils are the volatile liquids and aromatic compounds distilled from flowers, trees, roots, bushes, shrubs and seeds. An essential oil contains the true essence of the plant it was derived from and is highly concentrated. These oils have regenerating, oxygenating and immune supporting properties which can assist our animals in the healing process. Essential oils provide energetic balance and help in healing through the sense of smell. As the olfactory system is stimulated, physiologic functions are supported which allows the body to self-heal. They also have antiseptic, antimicrobial and detoxifying properties and can help with emotional issues such as anxiety and stress. In addition to direct inhalation another excellent way to get these benefits is by diffusing the oils in a cold air diffuser. Essential oils may also be used topically or ingested. As a rule when working with animals, LESS is MORE, as sense of smell is highly developed in many animals due to their instinctual nature. For example, a human has 5-6 million olfactory receptors while the dog as 220 million. Domestic and wild animals will naturally seek out plants that bring their bodies into a state of balance. Rubbing against a pine tree picking up the oils from the bark will help soothe sore muscles and joints. Burying their nose deep into an herb or flower, inhaling the aroma of the entire plant can help the animal keep calm. Or eating a plant and allowing the properties of the plant to be absorbed will assist with overcoming digestive upset. Whether working with humans or animals be sure that the essential oils used are therapeutic grade. Therapeutic grade oils are pure. They are grown, harvested and packaged with minimal harm to the plant. These plants are wild crafted, meaning the soil has never been exposed to chemicals and wind patterns are studied to see that nothing harmful can blow onto the soil. The plants are distilled with a low heat, low steam and low pressure process to maintain the integrity and therapeutic benefits of the plant. Synthetic oils are mostly made from petrochemicals, try to duplicate the smell of a certain plant and are created for a specific purpose, such as perfume. Fragrance grade oils used in perfumes do not assist with healing and can actually cause more harm than good because of their ingredients. Inexpensive oils are most likely not therapeutic quality. Caution should be exercised with cats when using essential oils with a high phenol content. Cats do not have some of the liver enzymes needed to help metabolize the phenol constituents of certain oils. Melaleuca oil (Tea Tree) should never be used on birds. Melaleuca can cause an adverse reaction in birds which may result in death. In maintaining the health and well-being of our animal companions just remember the LESS is MORE rule. When in doubt consult your veterinarian or a holistic animal practitioner who is experienced with the use of essential oils. --Young, G.D. et al (2011). Essential oils desk reference - Special fifth edition. Orem, UT: Life Science Publishing. --Shelton, M. DVM (2012). The animal desk reference - Essential oils for animals. CreateSpace Independent Publishing Platform. DBA On-Demand Publishing, LLC. --Komitor, C. CMT, HTCP/I, CHBMT, HTACP, ESMT (2013). Healing touch for animals level 3 workbook (6th ed.). Highlands Ranch, CO: Komitor Healing Method, Inc.
Click to read free now! 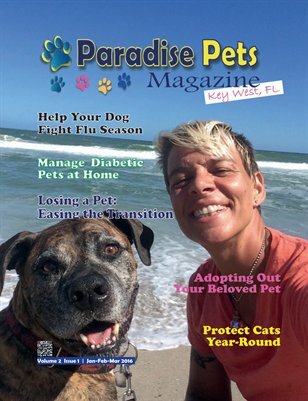 ​This article was originally published in Paradise Pets Magazine, Key West, FL Apr-June 2015 issue. You can read the entire issue free by clicking the cover image. Oliver modeling Bzees' Wander Slip-on shoes. Meet Oliver, the pit bull who is punching his timecard for the greater good. As the CCO (Chief Canine Officer) for Bzees — a women’s shoe company— he attends photo shoots and an annual brainstorm meeting (sans tie, of course). He’s also fetching hope by raising funds for U.S.-based animal rescue and advocacy groups, like I’m Not a Monster and Pets Across America. On top of all that, he’s turning the tide for pittys through Oliver’s Clubhouse: a Facebook page that encourages the fostering and adopting of the pit bull breed. You may have seen this former shelter pooch, grinning with a tennie tucked between his teeth, on the Home Shopping Network, where he soared as the number one pin of the day. Lori McDermid, Bzees’ Vice President, adopted the white and black pup at six months old from the St. Louis Humane Society. Lori brought him home on December 22, 2010, just one day before her family’s annual Christmas trip. Oliver refused to leave the house. He thought that budging from his bed meant he’d have to go back to the shelter, says McDermid. The family shoved his bed into the car. Once he got to the lake house and met Akita-mix Polly and Coonhound-mix Monte, he bloomed into a “love bomb”. Even after enduring chemotherapy and surgery for the mast cell tumor in his arm, he’s a “court jester”. Case-in-point: when Lori was tossing her dogs’ bedcovers into the wash, Oliver was shredding the beds’ foam. It was floating down everywhere just like a Christmas movie, and he plopped himself right in the middle of it. From a work perspective, Lori explains that Oliver gives “a purpose to what we do”. “We love making shoes, and it's important. We innovate products to help people live their lives better,” McDermid said. Fetching Hope and Oliver’s Clubhouse —which McDermid hopes to make into a physical pit bull rescue once she retires— adds another layer to making people's lives better. While Bzees never runs sales online, they run a promotional for a couple of weeks every quarter, donating $5 from each purchase. They raised $550 for WoofTrax and $1,000 for the Colorado State University Flint Animal Cancer Center. “[In the next quarter,] we’re looking to support a group that is educating dogs to help others [in] need,” she said. Click this cover image to read now free! 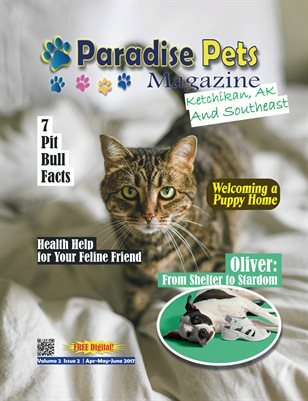 ​This article was originally published in Paradise Pets Magazine April 2017. You can read the entire issue free now! Karen Thomas, sharing love with Oliver. ​There is nothing more gratifying than adopting a pet from a shelter or rescue organization. You will be saving a life. Even if you adopt from an organization that has a no-kill policy, you will be helping to rescue another animal by making space available at the shelter. By adopting rather than buying a new companion animal, you will reduce the demand that drives the commercial breeding of puppies and kittens. Each year millions of healthy and well-behaved animals are destroyed in shelters simply because there are not enough homes for all of them. If you adopt a young adult or senior pet, you can avoid much of the diligent work related to house-training and teething. Puppies and kittens are cute, but they require lots of attention, training and patience. An older dog might fit in better with your laid back adult Labrador than a rambunctious puppy. Kittens are easier than puppies, but you may also want to consider the benefits of an adult cat who has already gone through the high-spirited kitten stage. Before bringing home your new pet (whether a puppy, kitten, dog or cat), do your best to make sure they are as healthy as possible. Obtain copies of all medical records from the rescue organization for yourself and your veterinarian. If your new companion hasn’t been examined recently, make an appointment with your vet for a complete physical exam. You’ll want to make sure your newcomer has a clean bill of health before exposing other animals in the home to any risk. Keep in mind that any change, even a positive thing like moving to a home, can be stressful for animals. Stress, travel and transport can aggravate underlying disease and may even cause physical ailments. Ask what food your new companion has been eating. If you’ll be feeding the animal something different, you’ll want to make a gradual transition to the new diet to avoid gastrointestinal upset. So, the goal is to minimize stress as much as possible. Along with the basic medical needs being assessed, take some time to inspect your surroundings. Are your home and yard appropriately dog and cat proof? Some common safety concerns include toilet seats, electrical cords and outlets, house plants (some are toxic to pets), garbage cans, and unsecured kitchen food storage. You may want to move valuable or fragile items from common areas. We use baby gates in our home to help keep curious puppies out of trouble. How can we help our new pet feel safe and loved in their new environment? Merlin (in the center) doing group training. I find it’s so important to designate a safe place where your pet can be away from the action — by his choice or by yours. He should be able to access the place himself whenever he feels he needs a “time-out”. You can also put him in there and close the door. It might be a crate, or even an entire room. This safe place should feel like a safe haven at all times. We use our ‘healing room’ as our safe place for the dogs. I like to diffuse essential oils to promote relaxation such as lavender or a favorite blend called ‘Peace and Calming’. I also created an organic essential oil spray blend called ‘Serenity’ which contains lavender, ylang ylang and frankincense. I always keep a bottle handy to spray inside crates, bedding, inside the car or directly on their coats to promote a feeling of relaxation. If there are existing animals in the home, communication is very important during this entire process. From the moment you’ve made the decision to adopt a new pack member, start letting the other animals in the house know this so that there are no surprises. Since they read our thoughts, I would show them mental pictures of the animal and how they can help ‘show him the ropes’ while interacting harmoniously. Since animals love to have ‘jobs’ I would assign each one a different job for the integration process to go smoothly. For example, I would assign the role of ‘peace ambassador’ to one and to another the job of being in charge of ‘toy sharing’. Spending lots of quality bonding time with each animal individually and collectively is very important during the first weeks that a pet is in a new home as well. Dogs, especially, crave routines, boundaries and rules. Cats like to know what to expect too. When pets don’t understand, they feel uncertain and may hide out under a bed or behind a chair until they feel a little more comfortable. Sensible rules and structure help pets feel secure in their environment. Being consistent with training, helping pets understand what behavior you want and providing a solid routine is very appreciated from a pet’s point of view. They become more confident when they know their role and what you want them to do. All too often animals are told ‘no’ as in what not to do, but then not shown an acceptable alternative behavior. When we first adopted Merlin, our Catahoula mix puppy, we established a daily routine which included pack walks and short training sessions a few times per day. He was eager to learn, and the other dogs loved the opportunity to model appropriate behaviors during the training sessions. ‘Group training’ is a great way to keep everyone involved in the integration process. The most important thing to remember when integrating a new pet into the household is to practice patience and enjoy the process. Things won’t be perfect overnight as it takes time to learn each other. Having high expectations can turn into feelings of disappointment quickly if the expectations are not met. Any negative emotion (fear, anger, anxiety) will be sensed by your new companion and may delay the learning curve. This would be a great time to start a spiritual or mindful meditation practice if you don’t already have one. Within a few weeks everyone will be more balanced. Feeling the unconditional love of a pet fill our home and heart is a gift, and giving them the love and respect they deserve is true compassion. May your hearts and homes always be filled with such love! Karen Thomas, R.N., is a certified Healing Touch for Animals (HTA) Practitioner in the Florida Keys. Healing Touch for Animals is a holistic approach influencing the health and well-being of animals through energy medicine and intention. HTA techniques restore harmony and balance to the energy system while providing physical, emotional, mental and instinctual stability, thus supporting the body to self-heal. This work can be done in person or distantly. Click the cover image to read the digital issue now! ​Many pet owners are not pet “owners” at all, we are pet parents and our pets tend to own us. When my children were teenagers, I saw less and less of them and became increasingly attached to our family pets, Joey (a Chihuahua mix) and DJ (our long haired Dachshund). As a mom, I wasn’t ready for my children to need me less and I became a “mom” to our dogs. Laugh all you want, but I know I am not the only one who loves our pets like children. Several years ago our family moved to Florida, and during the planning I could not bear the thought of leaving our fur babies behind. So, we paid astronomical fees to prepare them for travel and flew them across the country with us. Sometimes I wonder if we did the right thing by taking them out of their environment in Ketchikan, Alaska and moving them to unknown territory in Key West, Florida. While in Florida, Joey and DJ enjoyed fun in the sun, playing at the beaches, and chasing iguanas. We had to protect their nosey noses from trouble with snakes and scorpions—and other things we don’t have to worry about in Alaska. At one time, DJ had gotten stuck under our deck in the back yard, and my son, Chris, had to climb under and drag him out because he was unable to move—he had been paralyzed by a Cane Toad (of all things). With many prayers and healing touches, DJ escaped death by the toad and lived on to run around enjoying fun in the Florida sun. We, being Alaskans, were unprepared for the dangers that our beloved fur babies would be faced with in such a different climate. Within a year of moving to Florida, we were faced with housing challenges, like many in Key West are, and had to make the difficult decision to adopt our pets out to new pet parents who were able to provide a stable home for DJ and Joey. That decision was a painful one, but also an inescapable one. We had no other choice. The people who graciously accepted our fur babies into their lives, made it very clear that at any time we were able to have them again, they were more than willing to foster them for us. But that time did not come. It has been a couple years now since we had to say goodbye to our beloved pets, and now we are back in Alaska. As I look back, I see that I should have left them in their home environment in Ketchikan, rather than selfishly taking them across the country where DJ almost lost his life, and where we ended up losing them completely. If we had adopted them out before we moved, they would have been well cared for in a loving home with no snakes, scorpions or poisonous frogs to deal with. And they would have most likely still been in our home town of Ketchikan when we returned and we would be able to see them once again. Even though a piece of my heart went with DJ, and most especially Joey (my baby), I always have the peace in knowing that the people who adopted them were a perfect fit. D.J. with his new family. ​I will never forget seeing DJ run and play with his new Dachshund siblings, having the time of his life at the home of his new “Dad”, or seeing Joey in the arms of his new loving mama at the Kmart in Key West. I could see on her face that, like me, she couldn’t bear the thought of losing him, and I had to completely let him go. It was the best thing for us all. D.J. with his new Dad. ​In the past year I have traveled through many states, from Florida to Montana and then back home to Alaska. This was not planned, like many things in life, and I would have had a very difficult time traveling with even just Joey in my arms. Adopting him out to a stable home was the best thing for him, even though for me it was heart wrenching. I may have been late in making the difficult decision to adopt out our family pets, my beloved fur babies, but in all things, God works all things out for the good. Click the image to read the free digital now! You can read the entire issue free now by clicking the cover image. 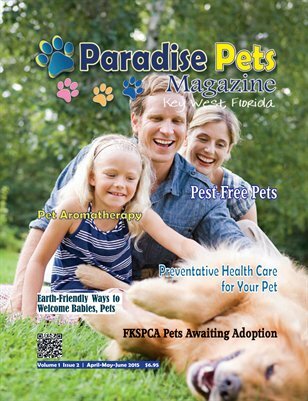 ​The Florida Keys pet shelters are overwhelmed with the many homeless pets they care for on a daily basis, more than 300 are housed at the Florida Keys SPCA (FKSPCA) shelters in Key West and Marathon combined. Nationwide, approximately 5 million pets are homeless and housed in about 5000 animal shelters in the scope of a year. Here in the Keys the FKSPCA houses more than 3000 of those homeless pets annually, according to Tammy Fox, Executive Director of the FKSPCA. Nationally, of those 5 million homeless pets, 3.5 million are euthanized at shelters. Fortunately, our FKSPCA shelters are no-kill shelters. Some of the pets they care for have been there for years. In the United States, out of the 322,050,000 population, only 70 million homes have a pet. While about 1,750,000 in the US go without a home, making it difficult to own a pet. Furthermore, many people live in homes that do not allow pets. According to Fox, moving seems to be the primary cause of pet homelessness in Key West. The housing market makes it difficult to find affordable pet-friendly housing, and when some have to move they are forced to surrender their beloved pets if they are not able to rehome them on their own. Some people, when forced into a difficult housing dilemma choose homelessness over giving up their beloved pet. What is needed is more affordable, pet-friendly housing, not just nationwide, but here in the Keys as well. Another option could be providing the ability to relocate to areas where there are more affordable housing opportunities, bringing family pets in tow. Not all can afford to relocate. But who wants to leave the beautiful Florida Keys? Very few, once here, envision ever leaving. And when they do, they often return. For those who reside in the Keys, please consider adopting a pet from one of the local shelters. There are many loving pets who need loving homes. If you are a landlord, please consider allowing responsible pet owners to rent from you. If you already own a pet, please be sure to have your pet spayed/neutered to prevent unwanted litters. Oftentimes, pets have children that are unwanted by their human pet parents, and those unwanted puppies and kitties end up in the local shelters, homeless. Click the cover image to read the digital issue free now!